It feels good to be back. I have been a little "MIA" the last few weeks. I decided to take some time off while moving to recharge my crafty mojo and plan the next steps for improving my videos and blog. There will be lots of fun things happening in the next little while! Anyway, today I created a card featuring the Halloween Tree and the Be Scary Stamp from So Suzy Stamps along with some fun Nuvo Drops in Bottle Green, Purple Rain and Ripened Pumpkin. I masked off an area of the card using some 3M masking tape. 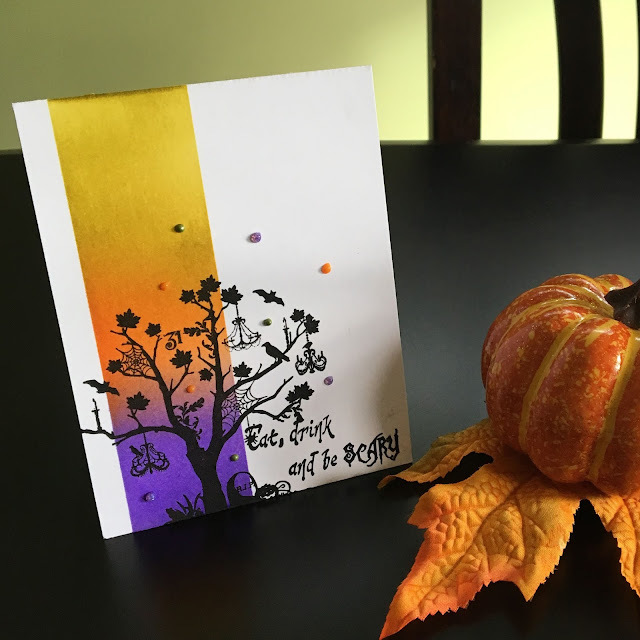 Then I distressed the card using Crushed Olive, Carved Pumpkin and Wilted Violet. 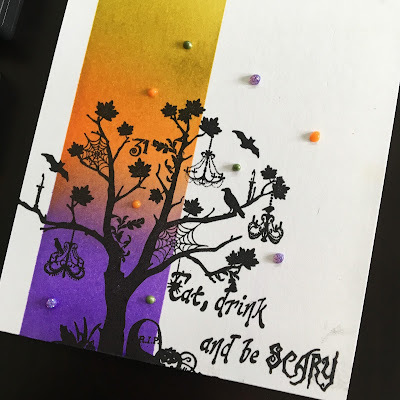 I made sure that when I removed the mask and stamped the Halloween Tree Stamp and Be Scary Stamp that I used the Mini Misti so I could stamp multiple times to get a very dark shade of black with the Versafine Ink.